Can I ask you a question? How often do you hear negative arguments or critics about Scrum? In my career as a Scrum Master I had at least two discussions a week and I really got tired of it. It felt like a big, never-ending ping-pong game with the developers, middle management or even the CEO of the company. There are always some foolish trolls who want to challenge you with the same arguments … over, and over, and over again. This post will tell you 5 strong and simple facts that will kill the most upcoming arguments against Scrum! Ready? Great, then let’s start. Normally this phrase comes from persons who haven’t understood that it takes time to implement Scrum. Every kind of change in an established culture causes resistance and confusion. Managers and Developers start getting frustrated and after a small period of time they cancel everything with the argument that Scrum doesn’t work for them. Then they jump back into their old habits and they lose a huge potential. This can be avoided by an experienced Coach who can guide the team through this challenge. There are many tools, techniques and values that a Scrum Master can share with the team. So it might be true that Scrum doesn’t fit into particular teams, but that doesn’t mean that the whole company has to shut down the entire agile transition. Fact is, right now Agile is the best risk management tool that exists, so it would be negligent and ignorant to generalize such an argument over the whole organization. This is one of the most popular judgment claiming I hear from all levels in a company! I can tell you that the quality of the meetings strongly depends on the Moderator because actually the Daily Meeting should not last longer than 10-15 minutes (depends on the team size). From my point of view you can kick the Estimation. Planning Meetings often tend to be very long, so actually the Scrum Master should coach the team to NOT define the solution into its deepest details. Furthermore there should be enough space for the developer´s creativity in order to solve a concrete problem. It’s very ok that a good Retrospective could last a while because this is the driving engine which brings the team into the next level. This is the magic moment where the team can discuss on how to get better. It should not be an annoying reunion! More it should motivate the members to become faster and better. All these meetings are strongly related to the product. The more transparency and coordination within the team, the better the quality they achieve. All other obstructive meetings should be strictly canceled or blocked by the Scrum Master unless there is a very good business reason to participate anyway. You need a very good Moderator … then everything should work like a charm. I’ve heard various managers saying that the implementation of Agile would cost too much money. When you hear that, you know you are not talking to a real business man. In a fast-moving business world even big organizations feel the pressure to innovate and quickly produce valuable products. If they take too long in bringing a solution to the market then they can be overtaken by a faster moving competitor. So you have either the option to remain in your old habits (hoping that there is no competitor who’s culture could produce solutions faster and better than you) or you invest into your existing people in order to be prepared for a stronger and faster market. Ultimately the winner is who adapts faster in the market, therefore it’s crucial to create a culture of constant change. Scrum is a framework that fits perfectly in that concept because you live in a constant feedback loop where you listen to your users and where teams can improve iteratively through their Retrospective. YES, it can be expensive, but the rewards are tremendous! 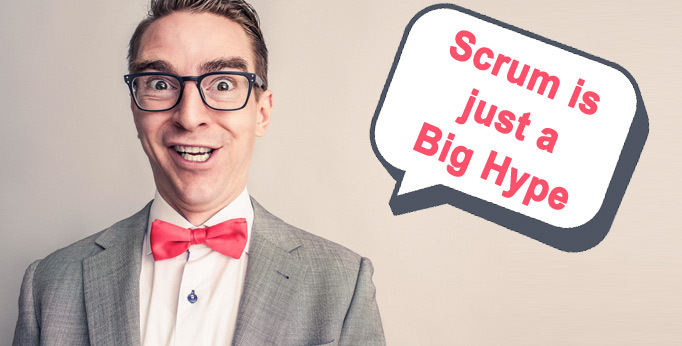 If Scrum would be just a Hype, then it’s already a very long Hype because I know many successful teams that are developing products with Scrum since more than a decade. I personally don’t care if it’s Scrum or Kanban or something else. That’s not the point. I see it more from the entrepreneurial point of view: The more we plan, the more spongy and unclear becomes everything. Long-term planning feels like trying to predict the future and as soon as you ship something to the users, conditions have changed. Scrum cannot be a Hype because it is NOT about the process. It’s about the way of working that depends on the mindset and culture of the people who are working together. Sure, there are some artifacts but those are NOT the center of the framework. It’s all about the ability of inspect and adapt! If you read the last 4 points attentively then you’ve noticed the importance of the Scrum Master role, especially when the company is right in the middle of a transition phase where all levels of the organization have to raise their transparency and communication. Most of the frustration in Agile pops up due to the lack of Coaching. If there is nobody who can accompany a team through that kind of change, people will block and resist with all their forces. That’s the reason why it’s crucial to invest into a good leader who can guide the team … and YES, those leaders are rare. That’s why a lot of companies hire a Scrum Nanny in order to save money. Unfortunately that strategy will cost much more money because you will suffer from high fluctuation, paralyzation of current processes and the agile transition will never happen. Instead of hiring a cheap Scrum Idiot, organizations should rather invest into an excellent (maybe high paid) Scrum Master who will make hisself useless within a certain time. That’s what every Scrum Master should do: Create autonomous teams that are able to navigate alone, so that he is not longer needed. Do you disagree? Other arguments you hear a lot? Don’t hesitate to share your opinion below. I would love to start a valuable discussion about this topic! As agile coaches we all have to deal with this prebuild ideas about Scrum, so thanks for sharing the great points you are making here. Regarding “It’s all about meetings and no work” I had to calculate the actual time in hours and percentages for meetings and work (Scrum + other work related meetings) for a team so they could see for themselves this was not the case. A pragmatic approach in all cases, whether its showing numbers, examples and results has helped me a lot. And also keeping an open mind to understand the feelings (mostly fear) from where this concerns come from. Thanks for sharing your experience! Actually I did kind of the same job once … I counted the hours we spent in meetings in a (2 week) sprint and the result was that we spent less than 10% in Scrum meetings. This was eye-opening for the whole team, what shows that it was more a perception / feeling. I believe the worse the meeting is, the longer it feels. That might be a reason why so many Team Members are frustrated about meetings. As I mentioned in the article, the quality of the meetings depends on the moderator who can generate so much value out of the meetings in a very short time.